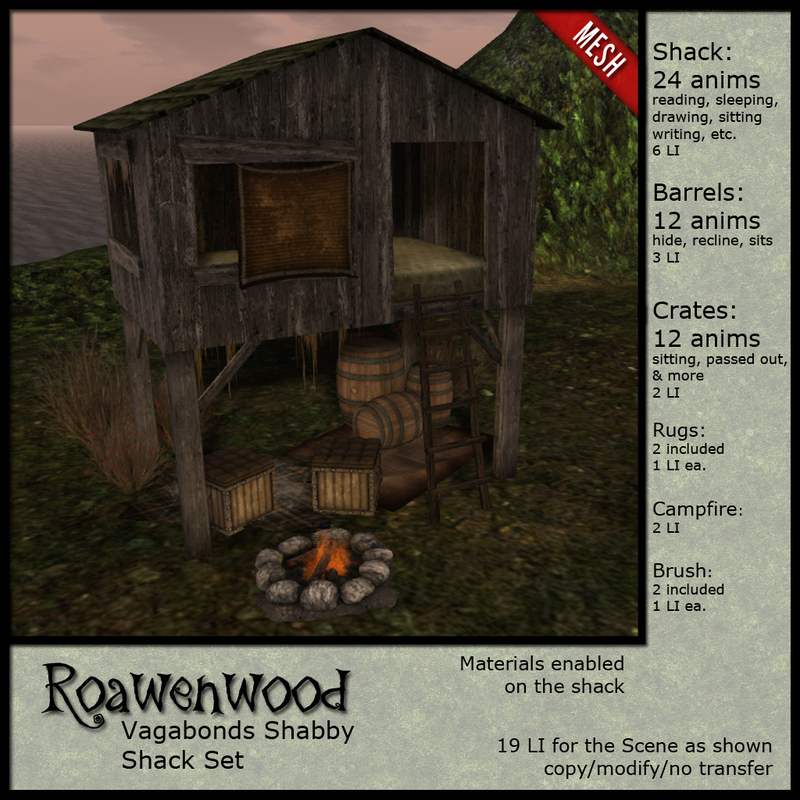 The Vagabonds Shabby Shack – We <3 RP!! Down on your luck doesn’t mean you can’t have a place to hang your hat. This month for We <3 RP I’ve gone and done up a little scene for the down and out. The entire set as shown in the picture with all those lil places to sit weighs in at only 19 prims. So that means you can have a nice little hide-away without spending a ton. That’s always a bonus. The set includes everything you see down to the bare branched bushes in the background. I was having a bit of fun filling it out as I was working on it so you get to have all of it. I just adore being able to create the feel of a place. Inside the package is the as pictured full rezz, along with all the pieces. As usual they are all copy/modify. Shift, change, use what you want and spread the love… can have a whole lil village of the things if you wanted really. The shack itself has 24 animations in it. Read, recline, relax, kick your feet out over the ladder… all of these things among others are included. It has a nice feel though the mattress is a bit worn of course, but being up on the stilts I would imagine feeling a wee bit safer than if you were stuck down on the ground. Beneath the shack nestled under at its belly there is the rest. Two rugs, each worn but comfortable… a set of barrels that have 12 anims in them. To hide, kick back, or be lazy you’ll find something to do and then the crates. Within the crate seating there is another 12 animations. So in total between the shack, the crate, and the barrels you are looking at a grand total of 48 animations, and room for however many people kicking around depending on what you decide to put out there. Fairly awesome. Side note… I just realized I forgot some I wanted to put in there. Damn. Ah well I guess next time or in something else. As it is a new release for the We <3 RP event it is going to be offered for the month of April at a 30% discount. That’s not bad…. considering once you apply that it is only 455L for the whole thing. Seriously. Rugs, crate, shack, barrels, bushes AND the campfire that you can mess with. Not a bad deal. The shack has materials enabled to make the wood pop out better, and everything look a lil more in depth. The event opens up today!!! You know this event has some fabulous stuff in it this round, I was peeking around and as always pretty much feeling blown away. 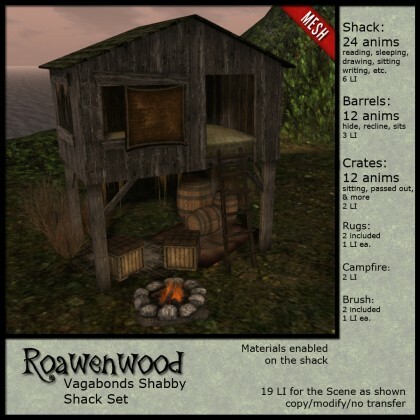 Posted in: Fantasy, Furniture, Gor/Gorean, Landscaping & Prefabs, Role-Play, Sales and Discounts, We <3 RP!